Thank you!!! Thanks for following us and for being here. we love!!! wait for more adventures in 2019! Publicado el 30 diciembre, 2018 Categorías tourism,tourism colombia,travel,travel bloggers,travel bloggers colombia,travel christmaxx,travel christmaxx colombia,travel colombia,travel couple,travel couple colombia,travel couples,travel diaries,travel diaries colombia,travesias emocionales colombia,wanderlust,wanderlust colombia,youtube,youtube colombiaEtiquetas adventures2019,channel,colombia travel bloggers,colombia travel tips,happy holidays,happy holidays Colombia,travel bloggers,travel tips,traveling couples,traveling couples colombia,wanderlust,youtube,youtube channel colombia travel,youtube colombia channel,youtube colombiaTags adventureDeja un comentario en goodbye 2019. 10 advantages of traveling at Christmas in Colombia. a family trip: Christmas is a time of family surprises, the best gifts are those that are experienced as experiences. A Christmas trip is an unforgettable experience. Travel diary: there is also the possibility of traveling as a family during this period of the year. the essential part remains and only the accidental changes. Christmas in the snow. If you are in a place with snow and you like this sport it can be an incredible way to get fit. travel with friends. Many people celebrate Christmas Eve with their families and friends. Do you like the idea? an added motivation. There are many motivations to enjoy Christmas. Organizing a trip is a personal aspect that makes you feel good. why postpone projects until the new year, if it is very important to enjoy the present. ★ Size 83x60cm. Our world map made of high quality materials. Take a coin to remove the paper from the surface, point out where you have been and record your travel stop in a unique way. ★ Our card is available in ready-to-use packages to delight the enthusiasts of your life. A perfect start to the conversation, give them a fun and special time to scratch the card with friends and family while sharing travel stories! ★ Enrich our map and add some holiday photos, of course you will receive many compliments! Add a little life to that boring house or office wall. ★ Keep track of the magical places you have visited and then plan the next place you go in a visual and organized way. Find out where you want to go in the future. ★ Give your friends a perfect gift: inspire others to explore the world and make sedentary people become passionate travelers! It is packed in a beautiful eco-friendly cardboard and recycling box and can be shipped at any time, so do not worry about wrapping paper! 5.0 out of 5 stars Agenda with ideal size and timeless. November 7, 2018. Color: Brown. Purchase verified It was for a gift, but I liked it even for me. Very timeless, with detail of leather engraving and with rudder to tie it and anchor to mark paper. He loved it!!. Also, when you fill it, you fill it and that’s it. Lovely. December 13, 2018. Color: Brown. Purchase verified. It’s very pretty. The leaves are brown they come but you can write well in them without problems. They came a little folded both the agenda and the sheets and I struggled to straighten them. Lovely. December 9, 2018. Color: Brown. Purchase verified. Lovely. Good value for money. ❤gift: great ideal gift for travelers, businessmen, women, business, creative writers, journalists of poets, artists, designers, students for birthdays, anniversaries or for anyone who sets out on a new adventure. Perfect size for use as a diary, travel journal, daily bullet or daily agenda, or to write notes, grocery lists, sketches and drawings. 7.9 “x4.7” measures so it fits in any bag or backpack for any trip. It is not genuine leather. October 3, 2018. Color: coffee. Purchase verified. 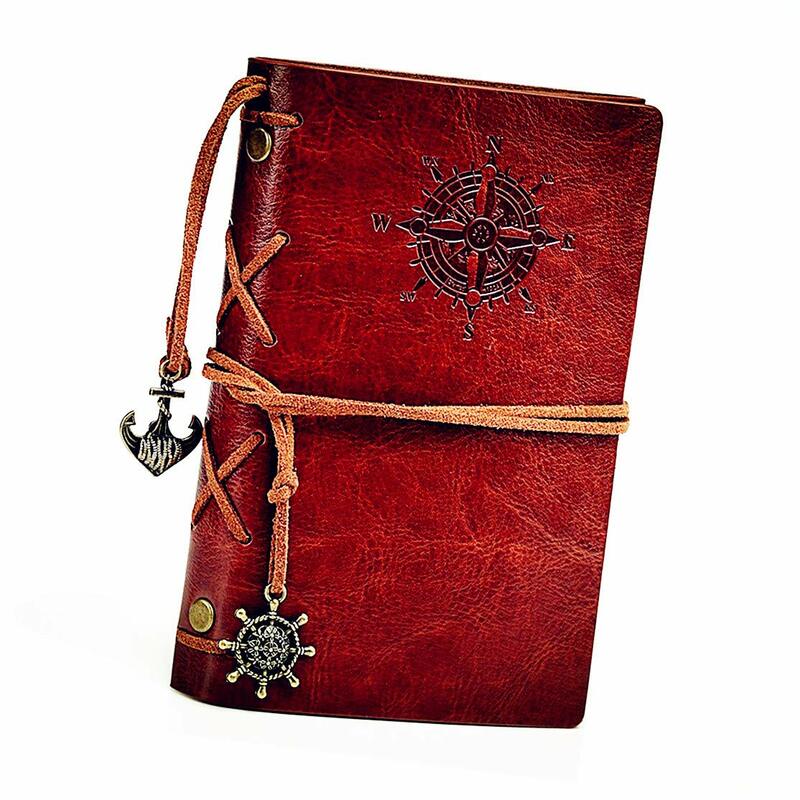 the product is fine for the price it has but it is not genuine leather so I do not recommend it. Besides the words on the cover make it impractical to use over time. 0 out of 5 stars Very successful November 26, 2018. Color: coffee. Purchase verified. 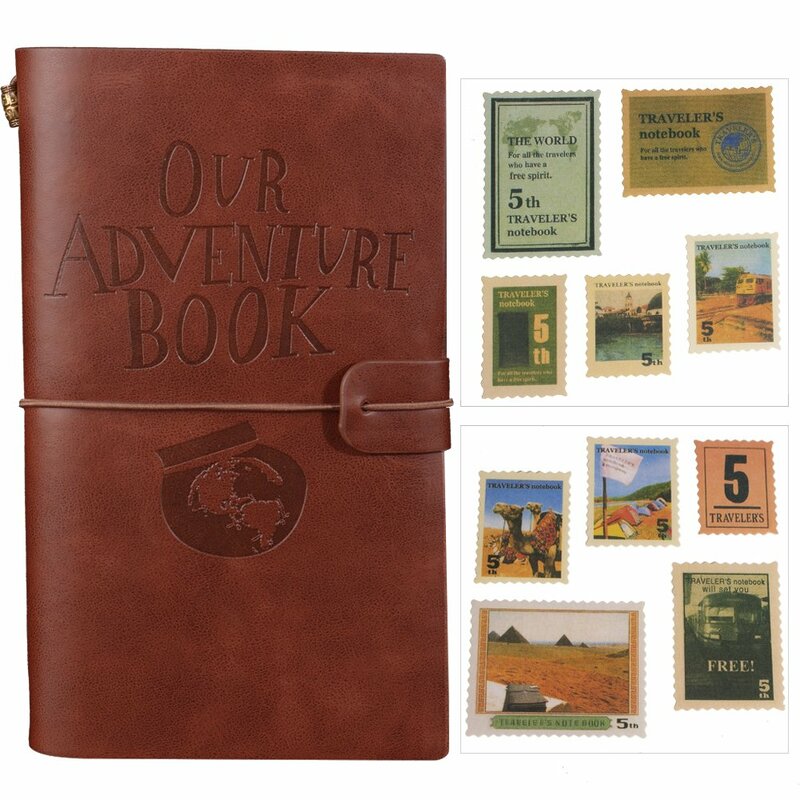 I used it as a travel notebook, to paste photos, tickets, receipts and other memories of a trip. The appearance and quality fulfill this function perfectly. Material: Durable soft PU and paper. Conveniently size 18 * 13 * 2.0 cm (L * W * H) / 7.3 * 5 * 0.8 inch, for travel and well made and sturdy. Blank papers are perfect for writing, drawing, drawing, pasting photos or recording your incredible memories. 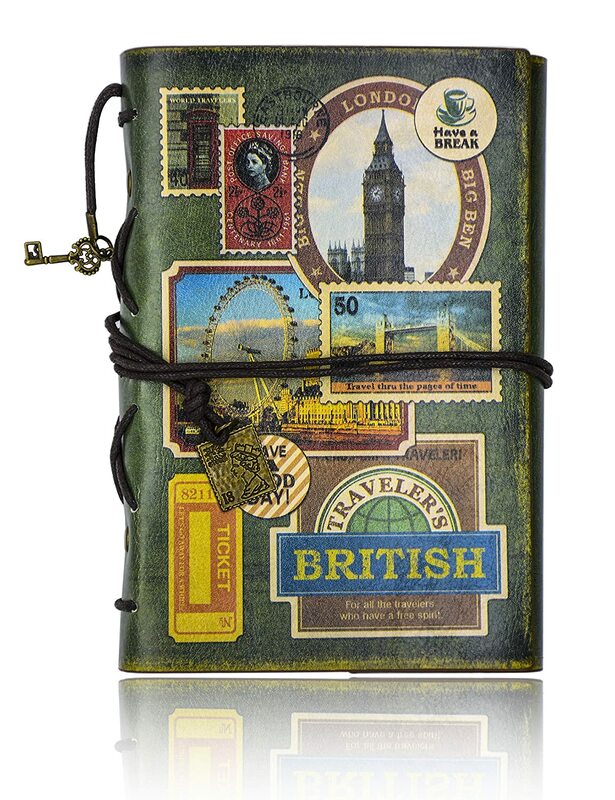 It can be used for your daily log, travel diary and note, A very nice gift for you or your friends. Good notebook September 11, 2017. Color: Color-2. Purchase verified.It’s fine.But I can not find a two-ring refill, I got a disappointment.For the rest is nice, the cord has an original closure I used to come with a turtle pendant, they can also place inside some photo, card , postcard … in the transparent cover. Beautiful gift for students, travelers or for those who miss the times of pens, pens and pencils. April 21, 2018. Color: Green-stamp. Purchase verified. Very happy with the notebook. It has a good finish and the size of the leaves is 17,40cm x 10.50cm. They are sepia in color and thick enough so that they do not stain the ink of the ballpoint pen or the pen on the other side of the sheet. The decorated tapas are very cool with images of English stamps with olive green base and very soft which makes it very practical to carry in your bag or backpack. It also has some sheets with compartments for cards and a document bag. Beautiful. December 3, 2017. Color: Color-4. Purchase verified. It is very beautiful, the lid looks like leather and handmade. As a craft, I just miss something to close it better. Publicado el 20 diciembre, 2018 Categorías monetize,monetize content,monetize travel content,monetize travel content colombia,tourism,tourism colombia,travel,travel bloggers,travel bloggers colombia,travel christmaxx,travel christmaxx colombia,travel colombia,travel diaries,travel diaries colombiaDeja un comentario en 10 advantages of traveling at Christmas in Colombia.